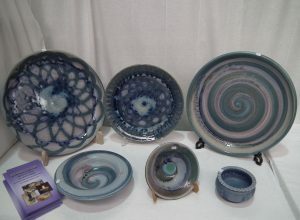 All our pottery is handthrown on the wheel using a high fired stoneware clay. 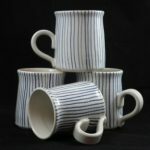 We use glazes that have been developed by ourselves in the pottery, resulting in a range of colours which are attractive yet practical. 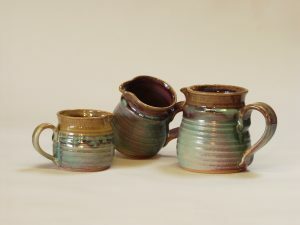 All our pots are microwave and oven proof and dishwasher safe. And put a mouse on it! 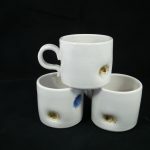 A lot of our customers like our “mouse pots”. 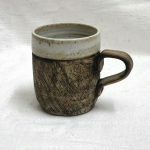 We have been making these for several years and they are as popular now as when we started making them. 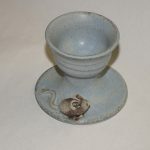 Little mice can be put on any of our pots! Below are just a few examples. A butter dish with a mouse. 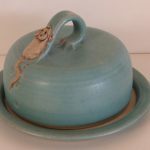 All our pots can have mice put on them! 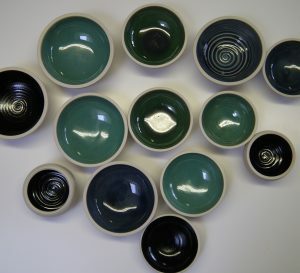 Gerry makes a wide variety of bowls. 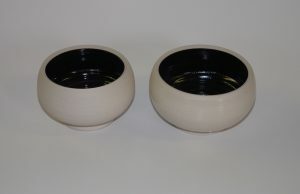 Some, such as cereal bowls are usually plain and functional. 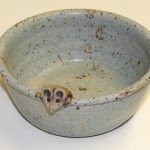 Others are more decorative but can be used for a variety of purposes -as cooking or serving dishes, fruit bowls, or purely as decorative objects to enhance part of your room. 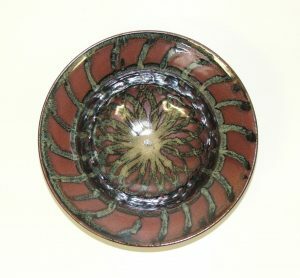 Bowl with a wide rim. 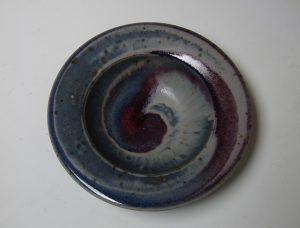 Decorated in the oatmeal-blue glaze, then overlaid with an aqua spiral. 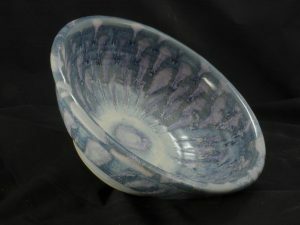 A medium bowl in oatmeal-blue. Decorated with rutile in a helix pattern. 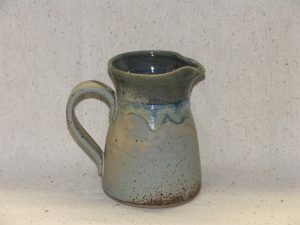 What would you use a jug for? Cream or milk? A table decoration? Arranging flowers – the choice is yours! 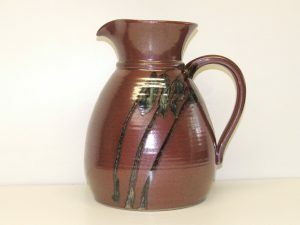 A litre jug – glazed with copper red reduction. 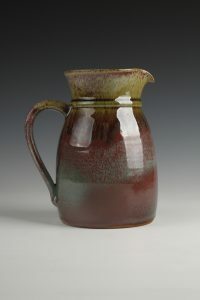 Jug with tenmoku glaze, overlaid with rutile. 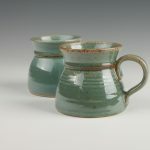 Cream jug, half pint jug and pint jug in aqua glaze. 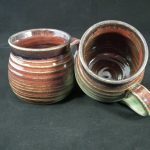 Larger sizes and different styles are available . They can be made in an assortment of colours. 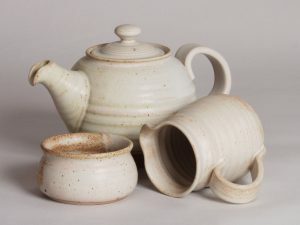 Tea Pots – to match jugs, sugar basins and mugs. Experimenting with shapes! 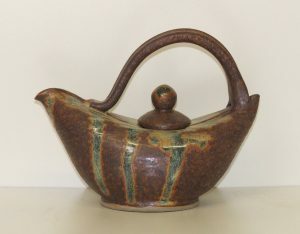 This teapot actually poured quite well! 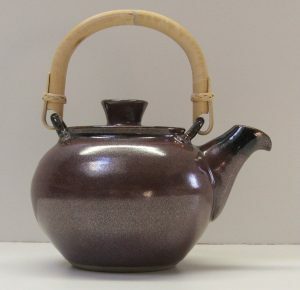 Teapot with cane handle, glazed in tenmoku. 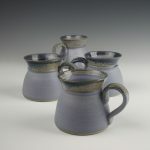 A teapot, half pint jug and sugar bowl in the oatmeal glaze.